Craft your deck with powerful faction cards, explore and exploit the system’s worlds, and gain the most influence so you can lead civilization to a new beginning in the wake of the Helionox. 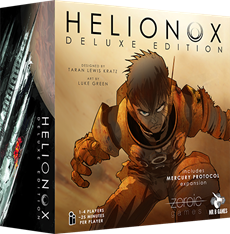 In Helionox, terrible events plague the solar system as the result of a dying sun. Players are the Architects of the future, vying for influence among the remaining populace. Helionox is a movement based deck building board game where great leaders vie for control in a shattered solar system. One to four players can attempt mastery over competitive, cooperative, and solo modes. Designed to play fast with a quick setup and an imminent ending, Helionox has tension to spare from the first turn to the last.